SINGAPORE - Habitat Coffee - the coffee joint along Upper Thomson Road - has been wowing fans since 2011 with its specially blended joe and hip cool vibe. No wonder then that the cafe often gets requests from customers who want to hold events there. "We could not accommodate those requests as we did not want to close off the cafe to the walk-in crowd," says Benjamin Ng, a partner at Habitat. Enter Top Deck, an event space located above Habitat. "We have been thinking about expanding the business, but know that we didn't want to open another cafe, especially when there are so many cafes around," says Mr Ng. When the space above Habitat became available, they decided to turn it into an event space. Since it opened last month, Top Deck has hosted private events such as birthday parties and gatherings, as well as corporate events, including a team building event and a Christmas gathering. It recently hosted a charity fund-raising concert. Top Deck will soon host its first wedding solemnization. "The possibilities to using this space is endless," says Mr Ng. Next month, Oh Happy Fry, an online children's accessories store, will be holding a 10-day pop-up shop at Top Deck. "This stretch of Upper Thomson is very F&B-centric, with very few retail options," says Mr Ng. "One of our objectives at Top Deck is to work with retailers to occupy our space and offer variety to the area." Top Deck is specifically designed to be an event space. The space is squarish, is largely column free, and has a high ceiling. It is fitted out with modular and stackable furniture so that the layout can be easily configured or should a client want a totally empty space, that can be arranged too. There is also a private enclosed area. A line of windows at the front, means the space is naturally lit, while still giving it a chic feel. Unlike Habitat Coffee which serves food, Top Deck has no kitchen, hence there is no food on the menu. Instead, Top Deck works with external caterers to meet food requirements when the space is hired. "The kitchen at Habitat Coffee is not large enough to cater to two outlets, hence we work with caterers," says Mr Ng. It costs S$600 to rent the space at Top Deck for four hours, with an additional S$150 per subsequent hour. Catering starts from S$17.50 per person, with a minimum of 30 orders. The space can seat 55 persons or it can make room for 70 people standing. When not used as an event space, Top Deck doubles as a cafe. The same blend of coffee as at Habitat is served from its Synesso Hydra espresso machine. Each cup goes for $5. "Even though we serve coffee, Top Deck is not an extension of Habitat," says Mr Ng. He points out that most small to medium-sized event venues are restaurants or cafes that double as event space. "Top Deck is firstly an event space. It doubling as a cafe is an extra service, a chance for customers to enjoy the space and sample the coffee we offer when booked for events," he says. Chinatown may be a new playground for modern eateries which are steadily pushing out old culinary landmarks, but now it also has to contend with more new neighbours - namely, upstart companies who are setting up shop in the neighbourhood. It's growing in popularity as a centralised spot for co-working spaces, the latest being 237 - named after its unit number on South Bridge Road. The double storey shophouse comprises a cafe on the ground floor, and a co-working space on the second. Some of its tenants include Newton Circus, a Singapore-based social enterprise and technology company dedicated to inventing communities and services that make the world a better place. There's also Urban Protyping or UpSingapore, which is a new movement where people from the public and private sectors come together to tackle the wide range of social and environmental challenges affecting major cities, and Padang&Co, a business which brings professionals from the civic innovation, data science and makers communities together. Daryl Arnold, chief executive officer of Newton Circus and founder of 237, says that the space tends to attract people who are "doing, making things and pushing boundaries". He says that there are benefits to being in a co-working space. "For a start, you are not saddled down with financial liabilities as you don't rent an office space," he says. "Working in an office can be a lonely affair, but here, you get to work with other people who may share similar experiences, and by working in the same environment as people from other backgrounds, you can tap on each other's expertise," he adds. People who work together also get to eat together, which is how Mr Arnold opened a cafe on the floor to turn this co-working space into a social space as well. "We often hold events here, and there is a need for food. We could rely on caterers, but it makes more sense to run a cafe inhouse," he says. He adds that rather than serving the usual fare such as fried bee hoon, the cafe focuses on healthy food that is sustainably sourced and made with fresh and quality ingredients. Spearheaded by chef Clement Ng from Koco Lifestyle, the kitchen strives to make meal time one of enjoyment, rather than just a means to fill the stomach. The food is simple but wholesome, with a menu that includes mushroom pesto tarts, and heartwarming soups such as tomato, carrot or chickpea. The cafe is open to the public, and on some evenings, the cafe's seating area is transformed into an event space. 237 has played host to several hackathons that gather people from different fields to improve Singapore's urban environment through the creative use of technology and data, as well as a diverse range of workshops, from creating natural skincare products to learning how to code. "Ideally, we like people to come in, have a meal, and see the activities that we do, and be inspired to take part in our events," says Mr Arnold. If you have been to The Fabulous Baker Boy (TFBB) at the foot of Fort Canning Hill, you may have noticed a room next to the cafe- bakery. TFBB's owner and head cook, Juwanda Hassim, calls the space That Spare Room, but it is more than just an extra space. He brands it "where art meets tart". The 538 sq ft space is a flexible community spot, to be used for arts events such as exhibitions, workshops, arts markets, and even dinners with a visual arts element. When Mr Hassim, a former theatre performer, first started TFBB in 2012, he sub-let his bakery space from the now defunct Viridian Art House. "We shared the activity and cafe area and they had a private gallery attached to the space," says Mr Hassim. When he took over the entire space, "I felt it was best to leave the gallery space as it was and support the arts community here in Singapore by showcasing their work. Thus That Spare Room was born," he explains. Since last April, That Spare Room has hosted programmes such as photo exhibitions, children's craft workshops, and a stone painting workshop. This year, it will kick off the 2015 calendar with a collection of paintings and sculptures presented by the Yellow Ribbon Project. Mr Hassim encourages arts groups or individuals or charity organisations to write in to use the space as he offers discounted or fully sponsored rates. He charges individual artists or arts groups S$78++ per day for exhibitions that are more than 10 days. For corporate clients, the space can be hired for S$540++ per day. Mr Hassim says that having a cafe bakery attached to the arts space "answers all the refreshments or catering questions that a gallery might have." He offers five food menus for events: two buffet menus, two banquet menus and a tea party menu. His buffet menu, which he charges at S$60++ per pax for a minimum of 30 people comes with items such as angel hair pasta with smoked duck breast and roasted lamb leg. The banquet menu is at S$50++ per pax for at least 30 people, and has dishes such as smoked duck salad, steamed seabass, and very berry chocolate trifle. The tea party menu has savoury foods such as spinach and feta puffs as well as desserts such as Mr Hassim's famous Ad Fab Red Velvet Cake and chocolate pecan tart. He charges S$38++ per pax for any three savouries, and seven sweet treats. "That Spare Room is both an event venue and an activity hub; a place for artistic collaborations, unique dining experiences and even beautiful weddings," says Mr Hassim. "The room is ever-changing, with happenings that keep it in an energetic state of flux. You can expect something new at every visit." The Keong Saik area is known for its hip eating and drinking places, but come March, it wouldn't be wrong to add hip working space to the list. Opening then is The Working Capitol, a hybrid space of co-working spaces, private offices, an event space and a cafe. "We wanted to challenge the traditional notion of what an office is, and redefine the workspace," says Ben Gattie, one of the three founders of The Bamboo Group, a boutique real estate and development company focusing on shophouses and small buildings in Singapore. Mr Gattie, with his sister Saranta, and business partner YC Teo, are co-founding members of The Working Capitol. Ms Gattie adds: "we want to build a community workspace where members can interact and work together in meaningful ways and we hope to foster an environment where members actually work together instead of just sharing a working space." 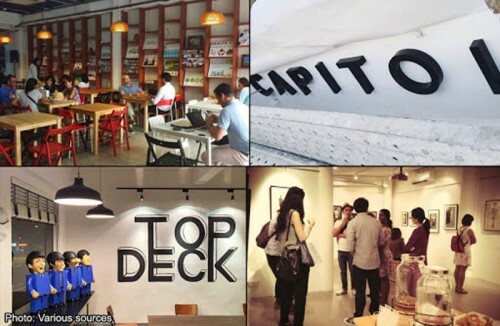 The Working Capitol is housed in five shophouses, with spacious workspaces, and well-designed sunlit interiors. Design firm Takenouchi Webb is the interior design consultant for the project. Understanding that the requirements and needs for every individual and company might vary, The Working Capitol offers a selection of different working environments: from permanent desk (Workdesk) and flexible seating options (Workspot) to private serviced offices (Workspace) that can accommodate teams of two to eight. "The entire space is designed to ensure that there will be many opportunities - for example in our cafe, beer garden, and lounging areas, or around our pantry islands - for people to come together to discover, create and collaborate," says Mr Gattie. Mr Teo says that The Working Capitol is designed for solopreneurs, startups, and small medium businesses operating at the intersection of creativity and technology. "Within these parameters, we are building a diverse community spanning industries such as: lifestyle, design and living, F&B, marketing and communications, management and consulting, and technology," he adds. The founders believe that a co-working environment will allow for the cross-pollination of ideas, and provide the perfect nesting ground for creative collisions. Members will be able to come together - whether through deliberate networking sessions or coincidental encounters at the pantry - and exchange expertise and share knowledge. The Working Capitol will have its very own cafe, the People Vs, which can be used for lunch meetings, networking sessions, casual gatherings, and after-work parties. In addition, the building will also house a few other F&B establishments, including Lolla's sister outlet and the modern Japanese izakaya, Neon Pigeon. More F&B names will be added later. Ms Gattie says: "Although we only launch at the end of January, we have been conducting regular viewings for weeks now, and are already in the process of signing on members to move into the space the moment our doors open." The founders say they are encouraged by the feedback received, from its size and aesthetic to the plans they have for it. "It seems evident to us that a local demand does exist not only for a physical place to work out of, but also for the kind of aspirational community and practical services we intend to provide," says Ms Gattie.